The existence of evil and suffering poses a problem to many who profess a belief in the God revealed in the Bible. God has revealed himself to be omnipotent, omniscient, and all-loving; God cannot be the author of evil and still be the God He has declared Himself to be. When evil is made manifest in suffering the sufferers cry out for restitution to those responsible. If God has made all things, and made all things good, why then is there evil? Is He not responsible? The free-will defense postulates that God is indeed good; and that his creation is good. One of the good things created within God’s universe was the freedom of the individual will. Free will makes evil possible, or rather God made evil possible by creating free will; but it is the incorrect exercise of free will that makes evil actual. Evil actions then are solely a result of human choice. God is hence removed from responsibility for evil acts. While they happen under His sovereign purview, He is bound to allow them for he must respect human free will. Without free will, mankind would lack the capability to choose freely and would be relegated to a world of determinism and would be incapable of making good moral choices. Mankind, too, would lack any culpability for the choices it made since acts would not be the result of free choice but some other compulsion. Key to this understanding is the realization that in this system of thinking, suffering can be seen as consequential to the acts of evil freely chosen by the will of others. In this system, misfortune is a consequence of free choice; God is removed as the responsible party and man is left with little recourse but to plea that God will deal mercifully with His creation based on their choices, whether good or bad. When considering the full ramifications of the free will defense, one cannot help but view God in a somewhat limited capacity. God is the creator of the universe, including freewill, but seems somehow restricted in the exercise of His power. Maintaining man’s ability to exercise a will free of coercion is paramount. In the words of Harold Kushner, “God gives us room to be human.” There is little room in this view for a divine sovereignty who arranges everything in advance. How we act determines whether or not evil occurs. The evil that we do, we do freely, otherwise we could not justly face punishment for our acts. God is left to react to our deeds and either redeem them or condemn them. So how does this explanation for evil and suffering interact with the text of Job? Within the created order on display in the prologue of Job there are many competing wills. Job wills to be upright and chooses to flee evil. His children will to eat and drink, perhaps to excess; as a result Job seeks to atone for them. The Adversary wills to roam about the earth and question the motives of God’s creatures. The Sabines and Chaldeans will to gain property via theft. These separate free wills collide and impinge upon each other resulting in the drama of the text. Absent the divine council, we would be left to sort out the disparate wills and watch how they interact; attempting to determine where, if anywhere, God is in the mix. However, within the text we have an unprecedented picture of how God interacts with his creation in the image of the divine council. Job’s exercise of his righteous will has gained God’s notice. But it is unclear as to whether Job is righteous due to his actions, or because God declares him to be so (1:8, 2:3). Satan’s desire (or will) is directed toward Job, in an attempt to see if Job can be made to curse God and renounce his righteous position. It is hard to escape the ramifications of the chain of events that follows. God grants the Adversary permission to strike Job; the Adversary in-turn uses the Sabines and Chaldeans as well as natural forces to do just that. While Job, his family, the Sabines and Chaldeans all appear to have free will, it is undeniable that they are being orchestrated by the foreknowledge and permission of God through his instrument, the Adversary. The wills of the attackers seem reliant on the Adversary; the will of the Adversary is reliant on God; and the will of Job, rather than being rewarded, is frustrated by suffering loss. Job has willed nothing to incur judgment yet, suffer he does. We are left at the end of prologue with an unsatisfied Adversary and an undeterred Job. If suffering within the free-will defense is seen as consequential, it is difficult to identify the freely committed evil acts of Job, his servants, livestock or children, that merited the consequences of suffering and death they incurred. Job himself, will argue as much in the following chapters as he seeks to defend himself against unmerited disfavor. The reactions of his friends illuminate for us the prevalence of the free-will defense within the ANE world. It is assumed by the parties that Job’s “wickedness is great, and (his) iniquities without end.” To each reproach Job will maintain his innocence and protest his state. Suffering, under the free-will defense and within the arguments of Job’s friends, is seen as a punitive measure taken by God to repay sin. There appears to be very few other explanations offered other than Job is receiving his just deserts for sin. Furthermore, they argue, he should cease his protest, confess and accept the world the way it is. In the Divine speeches God will effectively confound this man-centered defense and reorient Job’s view to take into account God’s control over creation and the comfort that brings. 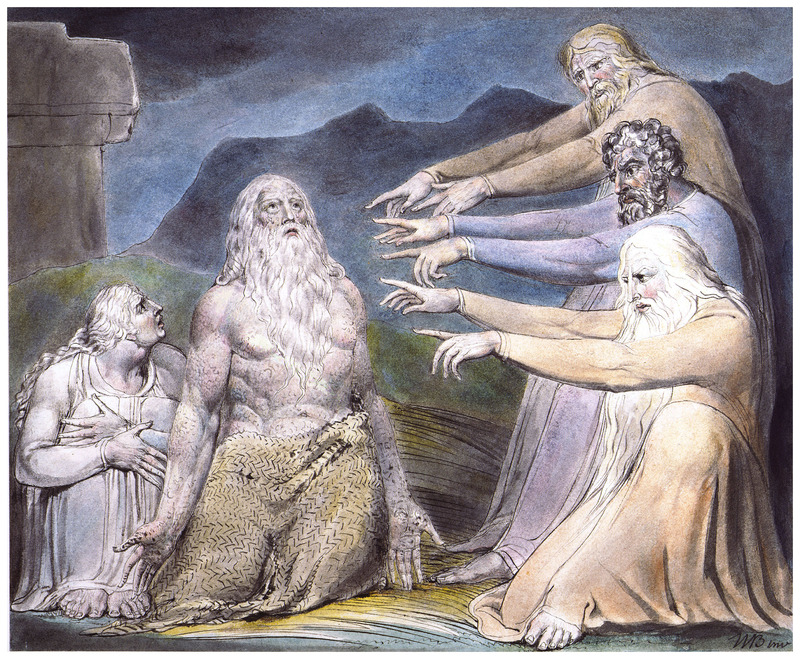 If Job has exercised his free will up to this point in questioning God and demanding answers, God immediately challenges Job’s will by in essence asking, “who are you to question me without knowledge.” God does not disprove the existence of man’s free will, rather he renders that free will as almost inconsequential within his creation. Whether addressing the creation of the cosmos, the stars in heaven, or the rain on uninhabited lands, God seeks to explode upon the mind of this man a vision of a world far more complex and glorious than previously considered. Indeed God validates Job’s innocent will, by failing to attribute to him any specific sin and restoring his lost possessions and health. So it would seem that Job’s sufferings are not the consequences of his actions. The free will defense maintains the absolute need of free will within God’s created order. However, God displays in His speech a control over nature that is absolute. His control extends even to those feared forces outside of man’s ability to control, behemoth and leviathan. Both creatures from the perspective of man seem to go where they please, it has been argued that leviathan is a representation of the Adversary himself. Hidden for some thirty-nine chapters, he reappears immune to the will of man. God asks, concerning leviathan, “will you take him as a servant forever? Will the traders bargain over him?” What man longs, in vain, to control God understands and overpowers. That evil arises from man’s God-given ability to will freely; and that God is somehow subservient to the necessity of that will’s existence, seems ludicrous in light of the awesome display of the divine presence in Job. God arrives at the time and in the manner of his own choosing; in a storm which “cloaks the fierce otherness of the presence of God in his fullness in the midst of the world of human experience.” God communicates the message that the only free will that is inviolable is His own, as He withholds light from the wicked and breaks the uplifted arm. We must conclude then that the free-will defense is lacking as an explanation for evil’s existence and suffering’s meaning. We shall next consider the privation defense; evil as a privation of good and evaluate it as it relates to the book of Job. Norman Geisler. If God, Why Evil. Grand Rapids: Bethany House Pub. 2011. 29, 31. Geisler, 38. Geisler states that the existence of free will is absolutely necessary in a moral universe, for “all moral choices are free choices.” To remove free choice would be to remove both praise and blame for any act committed. Douglas John Hall. God and Human Suffering. Minneapolis: Augsburg. 1986. 151. Hans Schwarz. Evil: A Historical and Theological Perspective. Minneapolis: Fortress Press. 1995. 103. This is the only meaning for suffering offered by the free-will defense, that those who suffer do so necessarily due to their sin or the sin of others. Marilyn McCord Adams. Horrendous Evils and the Goodness of God. Ithica: Cornell Univ Press. 1999. 34.